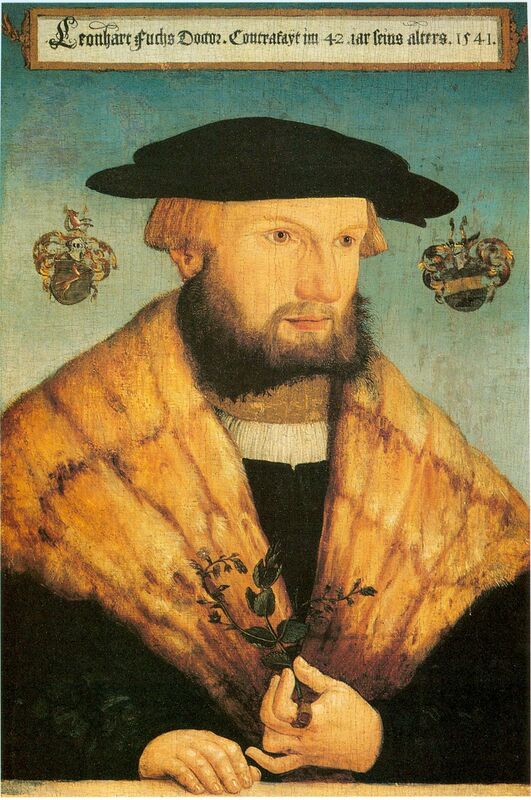 Fuchs was born at Wemding, Germany, on January 17, 1501. Little is known about his childhood. He attended the University of Erfurt, received a bachelor’s degree, joined the faculty, and opened a private school at Wemding, all while he was still in his teens. In 1519 he entered the University of Ingolstadt, soon earning a master’s degree in classics and, in 1524, a degree in medicine. After receiving his medical degree, Fuchs moved to Munich, where the political environment was favorable for Protestants (Fuchs was brought up Catholic, but had become Protestant under the influence of Martin Luther). In Munich he practiced as a physician, but, by 1526, he had returned to Ingolstadt to teach medicine. Fuchs became private physician to the Margrave of Brandenburg in 1528. Finally, in 1535, he began teaching medicine at the University of Tübingen, which would remain his residence for the rest of his life. At Tübingen Fuchs began studying botany in earnest, and, in 1542, his masterpiece, The Natural History of Plants, was published. The work, which was written as a medicinal handbook, includes precise descriptions of more than 500 native German and foreign plants, many illustrated with woodcuts. Fuchs organized the plants alphabetically and gave for each a description of its form, habitat, powers of healing, and the season in which it is best collected. He also included a glossary of botanical terms, an attempt to establish systematic nomenclature for the science of botany. The book made Fuchs famous throughout Europe; in 1548, the powerful Duke Cosimo de Medici of Florence asked him to become director of the botanical gardens at Pisa. Fuchs refused the invitation. Fuchs died at Tübingen on May 10, 1566. Fuchs’s illustrated herbal text played a key role in the introduction of accurate drawings and detailed descriptions to the study of plants. The work also helped lay the foundation for the emergence of botany as a science distinct from the field of medicine. The Natural History of Plants included unique elements that set the standard for further botanical studies. Botanists began to include in their works the type of organized presentation, accuracy; and beautiful illustrations found in Fuchs’s book. The book was among numerous botanical handbooks that led to the acceptance of botany as a field of study in its own right. Although many of those books were intended as field guides for the collection of medicinal herbs, they were immensely popular among non­physicians. In the seventeenth century, botanical gardens and specialized lecturers in botany emerged. Fuchs continued a conservative, descriptive trend in the study of plants, not introducing any new, revolutionary biological discoveries. Similarly, for the next century, botanists focused primarily on the detailed description of plant anatomy and spent relatively little time on other aspects of plant biology. Unlike Fuchs, many botanists did, however, identify and describe newly discovered plants, particularly those from the the Americas, recently discovered by European explorers. Fuchs’s legacy also endures in the name of a flowering­plant genus, Fuchsia. Members of Fuschia belong to the evening primrose family and usually sport flowers of deep pinks, reds, and purples. Posted on March 7, 2015 by Natalie. This entry was posted in Physicians. Bookmark the permalink.